For some couples, their wedding is the one time that they “spare no expense” and go overboard on everything from selecting the biggest banquet rooms in Swansea to hiring the most popular DJ for the reception. However, for many others, wedding planning can be a time of financial stress. However, there are ways to get the hottest South Coast event venue for your special day while still keeping costs down to a minimum. Consider the world-famous Venus de Milo for all of your important social gatherings and special occasions. When it comes to planning a Swansea wedding reception, we have all of the experience, space, amenities, and options you need to create the celebration of your dreams. When you work with Venus de Milo, you have lots of options with regard to space. Choose from our largest ballroom or create a smaller reception in one of our other featured rooms. Selecting a smaller space means cutting down the guest list. 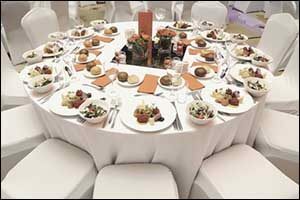 Costs for receptions are generally charged “per head” according to the number of guests that will attend. If you want to have a classic New England wedding with all the bells and whistles, but you need to keep it to a budget, consider reducing your guests. Many couples are now having more intimate gatherings of 100-200 people instead of trying to accommodate a guest list of more than a thousand. Stick with close family and friends, forget about co-workers, neighbors, and acquaintances that you hardly even know. This is your special day, and it should be about surrounding yourselves with the people who love and support you the most. Another way that couples are reducing costs is to hire a DJ/emcee instead of a band. Hiring a band means bringing in a bunch of instruments and paying a cost that covers that time and talent of each band member. When you hire a DJ for your Swansea wedding reception, they will often handle the duties of the emcee in addition to playing music, announcing special dances, activities, and events throughout the celebration. Check with your local South Coast event venue to get a list of pre-vetted DJs in the local area. This will save you a lot of time trying to find someone who can work within the insurance requirements of the facility. You will also likely get a better deal if you go with someone who has a regular working relationship with the venue where you will be hosting your wedding. Instead of having the ceremony at one location and the reception at another, consolidate everything at one place. Venus de Milo does lots of ceremony-reception combination events, as well have plenty of room on-site for all of your social gatherings and special occasions. Make sure to ask our on-site event coordinators about hosting your ceremony in addition to your wedding reception in our banquet rooms in Swansea. We have many beautiful options that will enhance your classic, traditional, or modern theme wedding ideas. The money saved won’t just be from having to rent or secure two venues, but also decorations and floral arrangements for both, transportation for you and the wedding party between both locations, and paying for the vendors to move between two set-ups during your wedding. We have five elegant ballroom spaces, and sites for both indoor and outdoor ceremonies, based on your needs. The food is the next place where you have a lot of options to save. Instead of offering a plated meal, you could opt to serve your guests buffet-style. Venus de Milo has earned a solid reputation within the region for providing some of the best-tasting food and the most extensive buffet menu options for weddings, social gatherings and special occasions. Set up a tasting day with our on-site event coordinator so you can choose the items that you want to include for your Swansea wedding reception. Even a small savings of $5-10 per person can really add up when multiplied by 100, 200 or more guests. 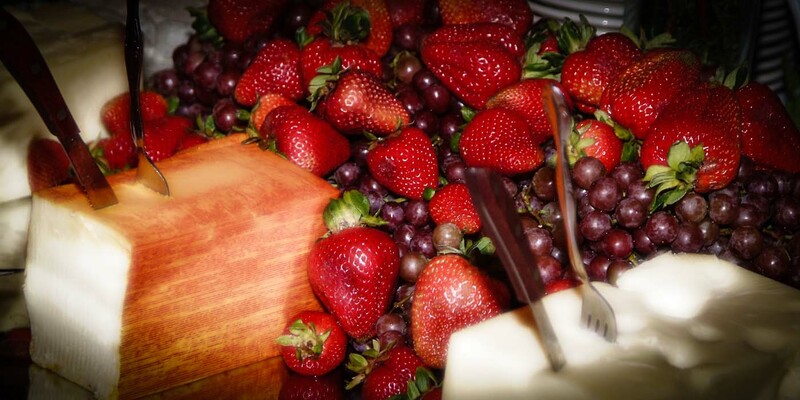 Our Signature Buffets include a coffee station, rolls, and butter, along with a carving station with your choice of meats, tasty sides, salads, and desserts. Ethnic buffet options are also available, including Asian, Spanish, Italian, and Portuguese. Ask about our wedding package meals, which include a cocktail hour of hors-d’oeuvres, “breads and spreads” display, soup or salad, champagne toast, plus your choice of entrees. We even have a breakfast brunch buffet option for early morning celebrations. If you are planning a wedding in the New England area, consider Venus de Milo. We are a premier wedding venue located in Swansea, Massachusetts near the Rhode Island border. We are conveniently located to guests coming from all over the northeastern region and can provide you with all of the space, amenities, and options you need to create a memorable wedding celebration. Give us a call at 508-678-3901 to schedule a tour of our banquet rooms in Swansea and discuss your plans for a wedding at our South Coast event venue.